Scleral lenses are very large diameter gas-permeable lenses ranging from 14mm to 20mm that completely vault the cornea, "land" and rest on the white part of the eye called the sclera, and create a reservoir of tears. Because of their size and this tear reservoir, they are typically extremely comfortable and at times may provide better vision correction than other standard contact lenses, glasses, and even surgery. 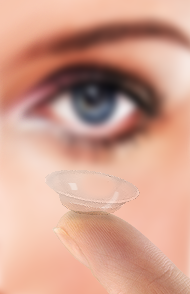 Scleral lenses incorporate a unique design that eliminates irregularities of the shape on the front surface of the eye to correct your vision. The lenses are made of materials that let oxygen pass through the lens and provide a thin cushion of fluid that stays between the lens and eye that makes them very comfortable, reduces redness and creates a healthy environment for the eye. The lens is appropriate for most prescriptions and is available for patients who need help reading (multifocal / bifocal) and those with astigmatism (torics). • Normal corneas - athletes and active individuals, patients requiring bifocal correction too! practice truly feels this lens modality can significantly improve one’s quality of life.